What: On April 1, NASA’s Marshall Space Flight Center in Huntsville, Ala., the American Institute of Aeronautics & Astronautics and the U.S. Space & Rocket Center in Huntsville will host a 40th anniversary celebration of the first use of the Lunar Roving Vehicle on the moon. The gala event honors the men and women who designed, tested, built and piloted the original lunar rovers — many of whom are expected to take part in the celebration. Members of the news media are invited to attend. NASA’s Lunar Reconnaissance Orbiter (LRO) team released Tuesday the final set of data from the mission’s exploration phase along with the first measurements from its new life as a science satellite. With this fifth release of data, striking new images and maps have been added to the already comprehensive collection of raw lunar data and high-level products, including mosaic images, that LRO has made possible. The spacecraft’s seven instruments delivered more than 192 terabytes of data with an unprecedented level of detail. It would take approximately 41,000 typical DVDs to hold the new LRO data set. Caption: The lunar farside as never seen before! LROC WAC orthographic projection centered at 180 degrees longitude, 0 degrees latitude. Credit: NASA/Goddard/Arizona State University. 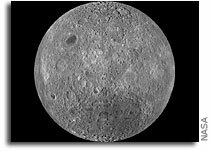 Because the moon is tidally locked (meaning the same side always faces Earth), it was not until 1959 that the farside was first imaged by the Soviet Luna 3 spacecraft (hence the Russian names for prominent farside features, such as Mare Moscoviense). And what a surprise – unlike the widespread maria on the nearside, basaltic volcanism was restricted to a relatively few, smaller regions on the farside, and the battered highlands crust dominated. A different world from what we saw from Earth. 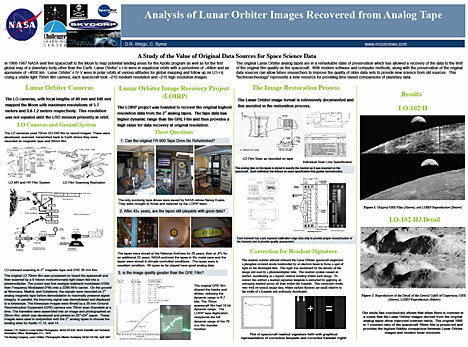 A Study of the Value of Original Data Sources for Space Science Data – Poster presented at the 42nd Lunar and Planetary Science Conference by Dennis Wingo and Charles Byrne. Figure 1: Lunar Orbiter II sub-frame 2070H2 superimposed on LROC NAC image M116154252LE. Submitted to 42nd Lunar and Planetary Science Conference. Introduction: In 1966 and 1967 NASA sent five Lunar Orbiters to photograph nearly the full surface of the moon. Each orbiter launched took images of different areas of the moons surface, or very high resolution images corresponding to lower resolution images previously taken. 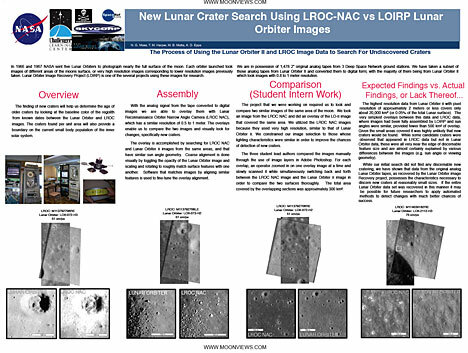 Lunar Orbiter Image Recovery Project (LOIRP) is one of the several projects using these images for research. We are in possession of 1,478 2″ original analog tapes from 3 Deep Space Network ground stations. 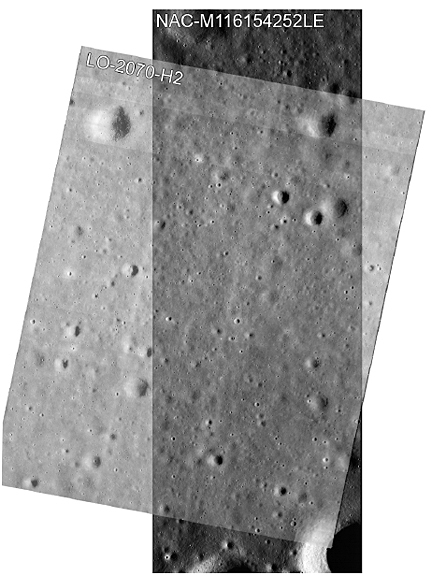 We have taken hundreds of those analog tapes and converted them to digital form; with the majority of them being from Lunar Orbiter II which took images with .8 to 1 meter resolution. 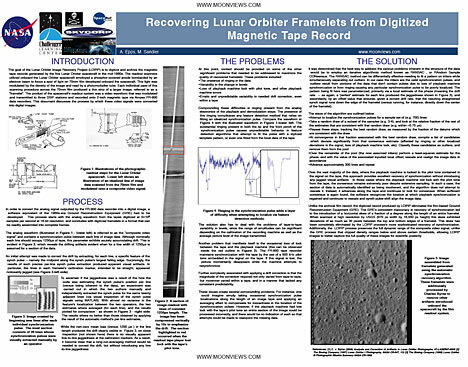 Introduction: The Lunar Orbiter Image Recovery Project (LOIRP) was founded in 2008 with funding from NASA ESMD to recover Lunar Orbiter images from the original 2″ analog magnetic tapes that had been held in protective storage by the National Archives and NASA for 40 years. Of the three central questions that had to be answered for project success, (can the tape drives be brought back to life, are the tapes any good, what is the quality of the data the best available), the final question, whether or not the analog image data on the tapes was superior in quality to the existing film was the ultimate criterion for success. NASA’s Lunar Reconnaissance Orbiter, or LRO, mission is sponsoring a series of workshops for educators of students in grades 6-12. These workshops will focus on lunar science, exploration and how our understanding of the moon is evolving with the new data from current and recent lunar missions. Workshop participants will learn about these and other recent discoveries, reinforce their understanding of lunar science concepts, interact with lunar scientists and engineers, work with real LRO data and learn how to bring these data and information to their students using hands-on activities aligned with local, state and national standards. Laptops are strongly encouraged for those participating in this workshop. — June 27-July 1, 2011 — Hinds Community College, Utica Campus, Utica, Miss. — June 27-July 1, 2011 — McAuliffe-Shepard Discovery Center, Concord, N.H.
— July 25-29, 2011 — John Hopkins University Applied Physics Laboratory, Laurel, Md. — Aug. 1-5, 2011 — Arizona State University, Tempe, Ariz. Applications for three workshops are due April 1, 2011. Applications for other workshops are due at a later date. For more information and to register for the workshops, visit http://lunar.gsfc.nasa.gov/lwe/index.html. Questions about these workshops should be directed to Andrea.J.Jones@nasa.gov.